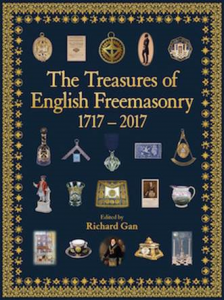 It was an honour to be asked to contribute a chapter to the new book The Treasures of English Freemasonry 1717 – 2017, which is a book by Lewis Masonic that celebrates the Tercentenary of the Grand Lodge in England. My particular chapter examines the ‘Antients and the Moderns’, and discusses how despite the differences, Freemasons from lodges at a local level could interrelate and move between the two Grand Lodges. In contributing to the book, I join such eminent Masonic historians such as John Belton, Diane Clements and Richard Gan. The book itself is edited by Richard Gan, Richard’s previous work included editing The Square Magazine for a number of years. The book has ten chapters in all, each written by a different Masonic scholar, and features 200 photos of Masonic treasures that are held at the United Grand Lodge in London. A copy can be ordered direct through the Lewis Masonic Website.